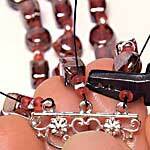 You can use calotte to create a multistrand jewellery item, or via the use of a cone. You can also use an end bar at each end for an even more decorative effect. If you have a fastener with several integral loops, then that could be used to replace using separate end bars for a similar appearance. End bars come in a huge range of designs and shapes, providing you a wide possibility of different looks using the same technique below. 1) If you are making a bracelet, it is easier if you crimp your wires to the loops of one end bar before threading your beads onto the wire. 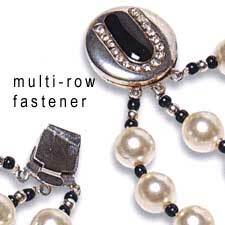 Otherwise you can choose to thread your beads before crimping each of the wires onto the end bar. 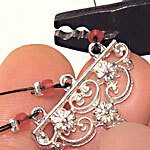 2) Once your beads are threaded and in place, use more crimps to attach the wires to the other end bar. Thread the leftover wire back into some of the beads to hide the end wires. Use a wire cutter to cut off any unsightly wire leftover. 3) Attach a fastener of your choice to your end bar.